This is the lemon cake that my Nana usually always makes for me when I go home to California. We both forgot about it during my last visit and I didn’t realize until I got back to Sicily that I hadn’t had my Lemon Jello Cake fix. Luckily, I have the recipe! And lucky for you, I’m going to share it! This is one of the easiest cakes you can make and I will argue that it’s one of the best-tasting cakes you will ever eat. What makes this cake so great is the glaze. The cake is baked in a jelly roll pan so it is only about an inch thick. After it’s done baking, you pierce the cake all over with a fork and spread it with the sweet-tart lemon glaze. 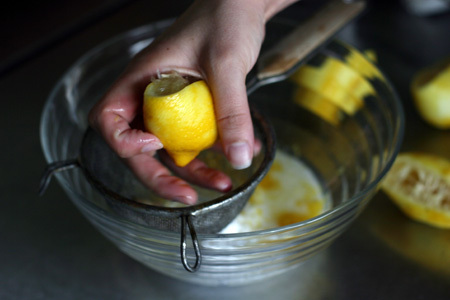 The glaze sinks down into the cake and the result is the best lemon cake EVER! 1. Preheat oven to 350 degrees. Butter and flour a 18 x 13-inch jelly roll pan. 2. 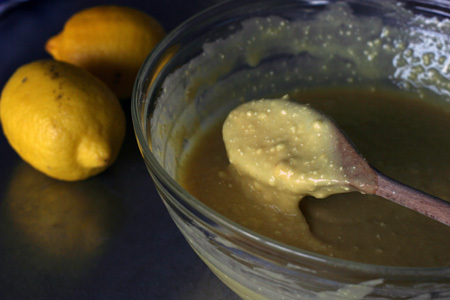 Pour cake mix and lemon jello powder into a large bowl; whisk together to remove any large lumps. Stir in the water then add eggs and oil. Blend, using a wooden spoon, with 50 strokes. There will be lumps, this is ok.
3. Pour batter into a greased and floured jelly roll pan; smooth batter with a spatula so that it is even. Bake 25 minutes at 350 degrees, checking after the first 20 minutes. 4. While cake is baking, mix together powdered sugar. lemon juice and zest. 5. While cake is still warm, pierce with fork all over then spread glaze evenly over the top. Allow to cool, then cut into squares and serve. As you can see, the batter will be lumpy. It’s important to smooth the batter evenly with a spatula after pouring it in the jelly roll pan, so that it will bake evenly. 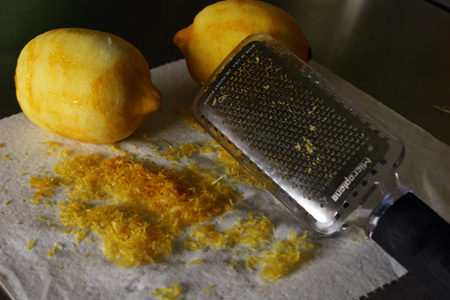 One of the greatest inventions ever, the microplane grater is perfect for zesting a lemon in seconds! How do you juice your lemons? I usually just squeeze them by hand, using a small strainer to catch the seeds. 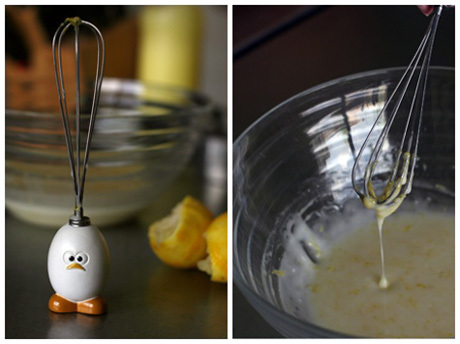 When making the glaze, you don’t have to use a cute little whisk like this one. But it always puts a smile on my face! 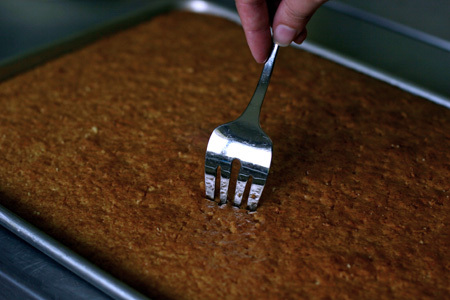 After the cake comes out of the oven, pierce it all over with a large fork. 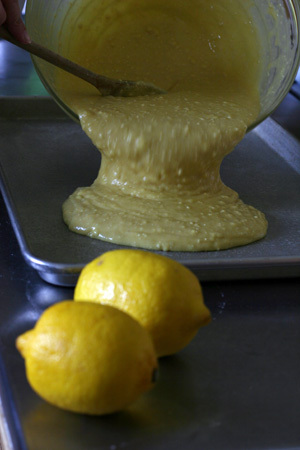 The holes will allow the yummy lemon glaze to penetrate the cake. 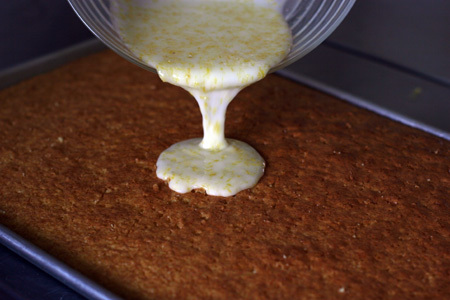 After the glaze is poured over the warm cake, make sure to spread it out quickly and evenly with spatula. As the cake cools, the glaze hardens just a bit. Now is the time to dig in with your fork before dividing the rest into squares! Lemons, lemons and more lemons! I love them!!!! This recipe looks simple and more importantly delicious! :) I'm going to try this out this weekend, I'll let you know how it turns out. Thanks Nicole, beautiful pictures as always. NANA'S LEMON CAKE! I loooooooooooove it. This is a MUST TRY for everyone. Even I can make it...it's that easy! Man, now my mouth is watering. I want some of that cake! Ruby: I really can't believe that I don't have more lemon recipes on here! I really need to get to work and post some more because I use lemons several times a week! Hope you guys enjoy the cake this weekend!Corinne: I know, this is a cake that really is rated "E" for everyone! So easy, soooooooo good! I had to take the cake to the guys in the office today because if I would have left the whole thing here, it would already be in my stomach! It got rave reviews from everyone there too. Erin: I use a tripod and either set the timer on my camera or use the remote shutter release. It's kind of a hassle to take photos while I'm in the middle of cooking or baking something so it doesn't happen that often! giving away our family secrets, eh? LOL i love this cake and can't imagine anyone not liking it, even a little bit. looks amazing, nana should be very proud of you! Aloha, I'm relatively new to your site, and I love it. Thanks for sharing so much with us! Talk about a stroll down memory lane...my mother used to make this very cake for us growing up, but she used a bundt pan. Of course the glaze is the best part. In fact, it was the cake for my first birthday,...37 years ago!!! I just told my kids about that very thing not even a week ago. Now, I HAVE to make it this weekend.. too much of a coincidence to not accept the need for really good cake. We gotta continue the tradition here as well. Your photos are so delightful. Mahalo and aloha!! We thank you for sharing it with us! you are right. it is the best lemon cake ever. thanks so much for sharing. Joe: Yes, I actually did get lemon juice on the camera. And today I accidentally got flour and butter all over my remote shutter switch! But hopefully some good biscuit-making photos will come of it!Amy: Haha, some things are so good they have to be shared!Mischelle: I'm sure this cake is great in a bundt pan, too! Isn't it funny to find out that the exact same recipe can be a tradition in other families? I think it's great! I hope you make the cake and that your kids love it as much as we do :-)Cynthia: You're welcome! Thank you for the visits and nice comments ;-)Christina: Did you just make it or have you tried this recipe before? I gave most of this last batch away and now I'm wishing I still had some left! What variety lemon did you use? I suppose it doesn't matter. While researching this I found out that a lemon is technically classified as a berry! I prefer lemons with tartness that can be offset easily by its' sugar content. I made them and they turned out yummy! One problem I'm having is I can't stop eating them! Thanks again! Steven: Just regular lemons, any variety should work but I wouldn't use Meyers because for the glaze you need something very tart to balance all the sugar: But I don't think you'd find meyer lemons yet anyway :-)Ruby: I was wondering if you made it over the weekend. Glad you liked it! This cake reminds me so much of my childhood--my mom used to bake lemon cakes for our birthdays (also from cake mixes) and we loved them! i'll definitely give this one a try. looks good! This sounds so good! And good info about the lemons, I was wondering if I needed to go get Meyer lemons but I'll just use the regular ones. Thanks! 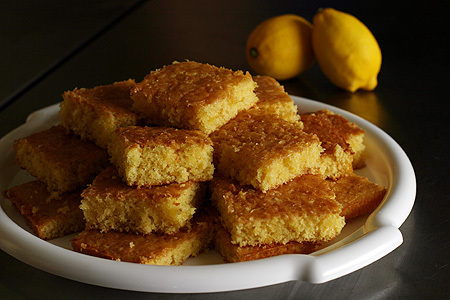 I wish somebody would make me some lemon cake.Have you tried using the zest from those big Sicilian lemons? Jason: No, I've never tried zesting one of those but I think it would be hard since they're so bumpy! What of the rind then? Have you found any use for that? What is the size of a jelly roll pan? Is this the same as a half sheet? Jason: Well, you eat it, remember! The thick white part is dipped in chili-salt and eaten as a snack. I can't remember if I told you that I tried it at a festival after you guys left.Bruce: It is a half sheet pan, 18"x13". The cake can easily be baked in a regular rectangular cake pan though, just add extra baking time since it will be thicker. Just bake until a toothpick inserted in the center comes out clean. i just made it for the first time. and i got RAVE reviews from my husband--who doesn't like desserts without chocolate--and everyone i've given a piece to. i want to hoard it! Soph: Thanks, I'll give it a try sometime! Oh My Goodness!!! My mom began a tradition, bringing this cake to our second son on his birthday every year from the time he was about 3 years old. He turns 39 this week, and his only request was "Grandi's Lemon Jello Cake." Hiding his cake became the ultimate challenge for his 3 brothers. No one ever felt satisfied with one serving . . . I found the remaining cake still in the pan in some pretty peculiar places, well hidden from the birthday boy! Will be baking this on Friday . . . once again. "Grandi" went to Heaven in 1995, but her cake lives on forever! I made this cake one Sunday afternoon and it is so easy to make and so delicious. My husband got up the next morning for work and had a piece of cake @ 6:00am and made the comment "sweety this cake is so delicious". Very easy to make and so moist and delicious. 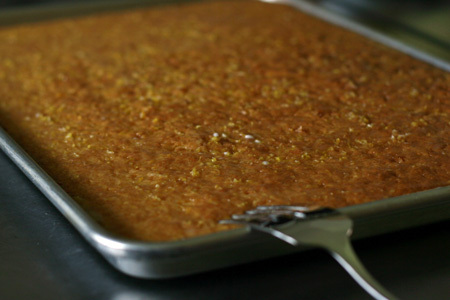 My grandmother makes the same, or a very similar recipe, but she bakes it in a bunt pan. It's ridiculously good for something made with jello. We made it a couple of years ago for a graduation party, and we just kept adding lemons to the glaze. It was delish. Is it made with lemon jello or lemon pudding by jello? No waaaaaay!! MY nana (in California) made this exact same lemon jello cake for me every year on my birthday. I think we must share a gene pool. The sweet-tart crumbly glaze on the top is my favorite part. Absolutely wonderful. An older couple that were neighbors to my parents make this cake and when I moved, I scoured the web trying all sorts of different combinations and finally found the right one!! Thank you so much! I've used this for birthdays, Christmas, and office parties and it's always a hit! Amazing post. I agree with almost everything you said! Nice post. I used to be checking continuously this blog and I am inspired! Extremely helpful info particularly the remaining section :) I handle such information much. I was seeking this certain information for a long time. Thank you and good luck. Fantastic lemon cake. Absolutely great tasting and easy to prepare. Love it. Nice work on the images too.